Yesterday my husband and I celebrated our third wedding anniversary. I woke up to a beautiful present, he bought me flowers, came home early from work, settled the babies for the night and finally as I went to bed I found a beautiful Swarovski bracelet on my pillow. Yes, I know he’s a keeper! I really hit the jackpot when I married him. Earlier we would have gone out to dinner, wined and dined till the wee hours of the morning. Now that wouldn’t go down too well with our eight month old boy and his furbling. Needless to say then our stay at home dinner had to be something special. 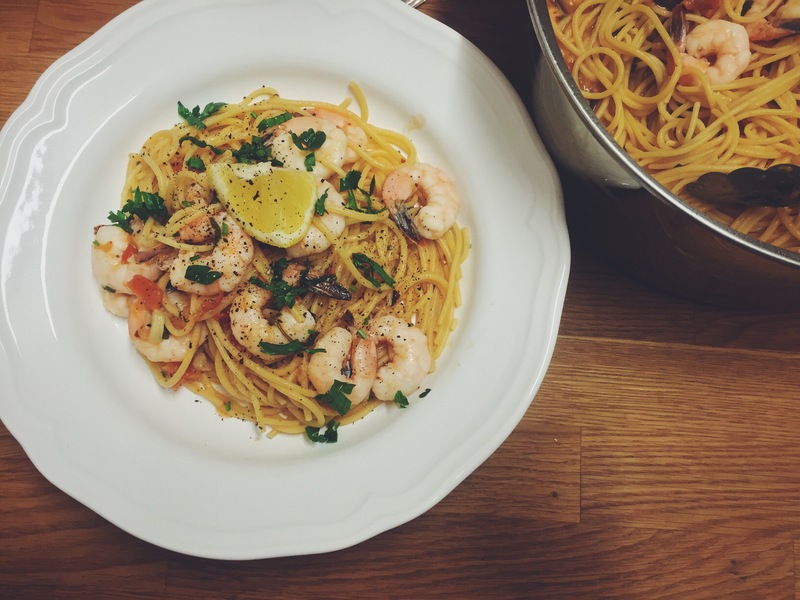 One of my husband’s favourite dishes is my prawn linguine. 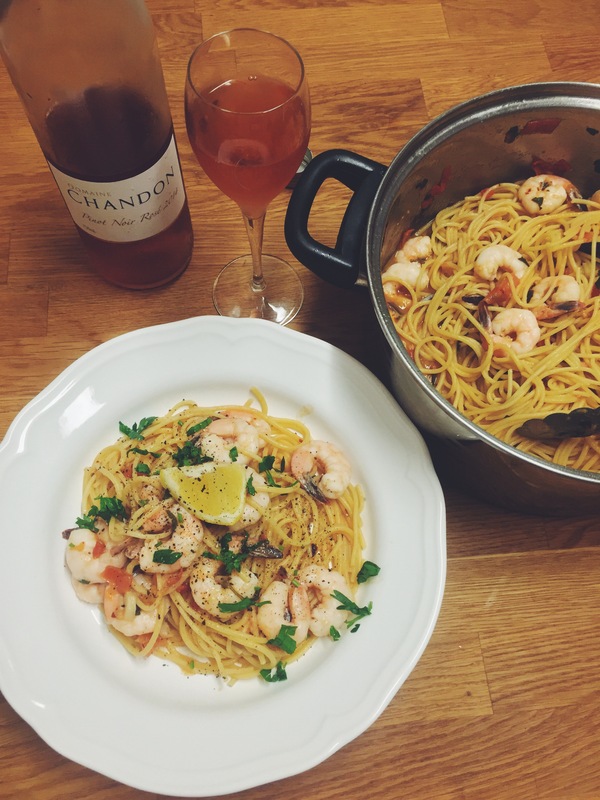 A touch of wine, a touch of chilli, loads of garlic and of course succulent prawns. What’s not to love? So if you are looking to celebrate something special in the comfort of your own home then this is the dish for you. Cook pasta as per packet instructions until al dente. In another pot heat three tablespoons of olive oil in a pot. 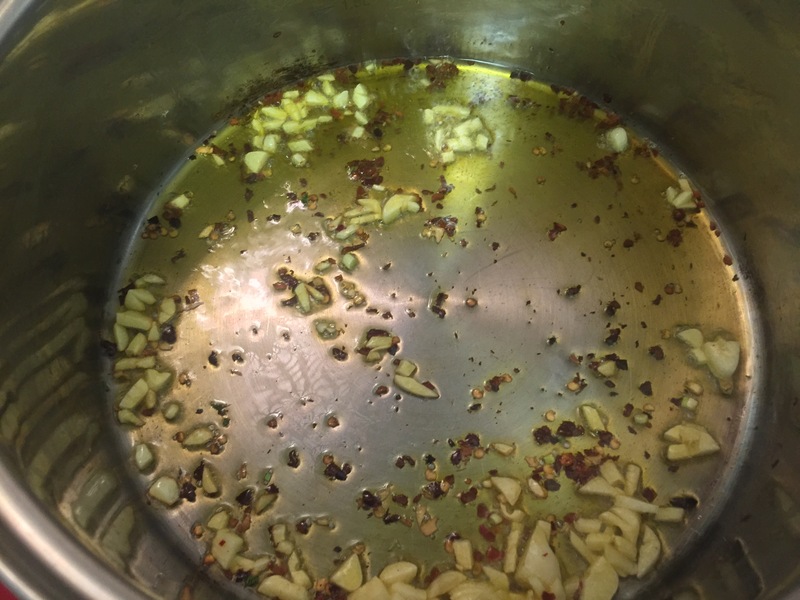 Add garlic and chilli flakes, cook until aromatic. 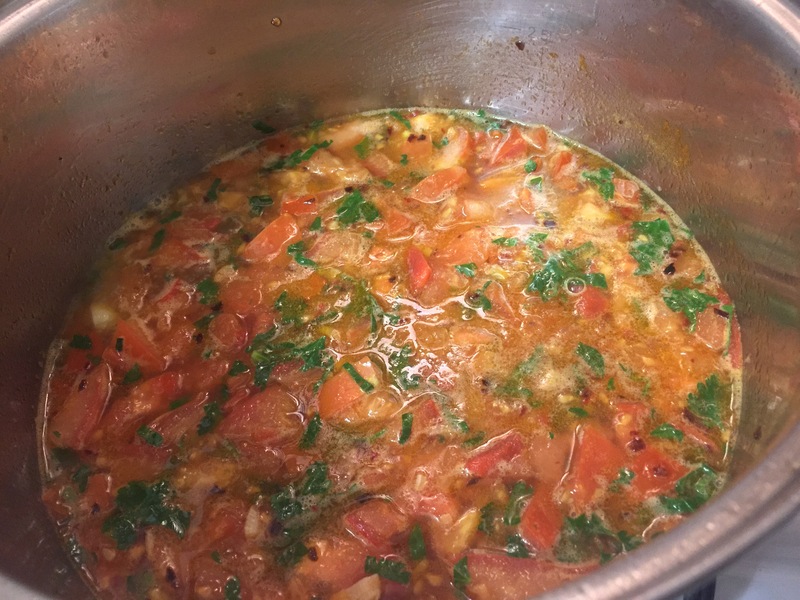 Now add tomatoes, parsley (some some for garnish). Cook tomatoes until slightly soft. Then add white wine, lemon juice and let the sauce simmer for three to four minutes on a low heat. 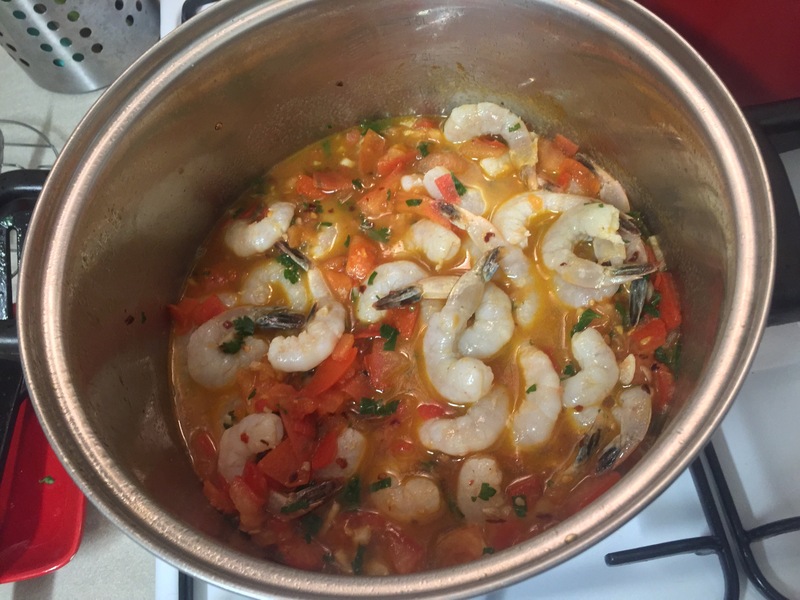 Add the prawns and mix well. Season with salt. 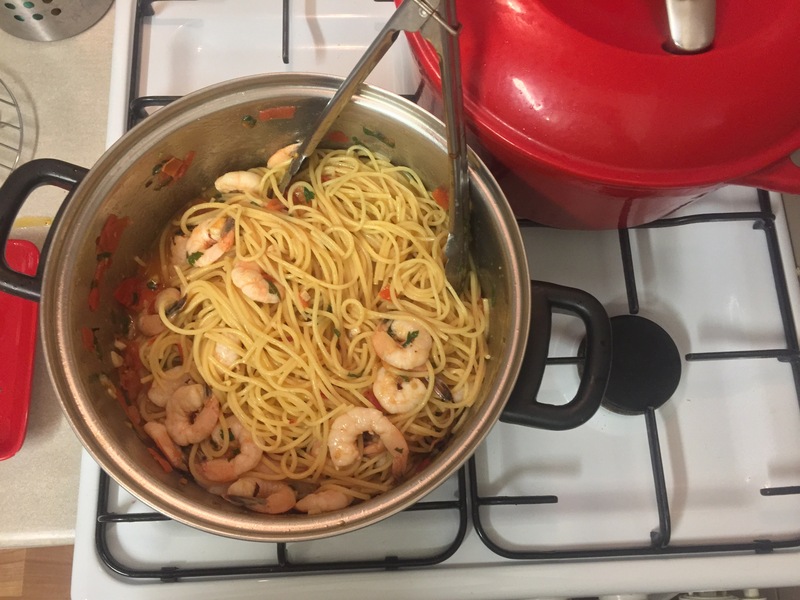 Once the prawns start to change colour and start getting orange add the pasta. Toss the pasta well to ensure the sauce evenly coats the pasta. Finally add remaining olive oil, you can use more olive oil if the pasta looks dry. 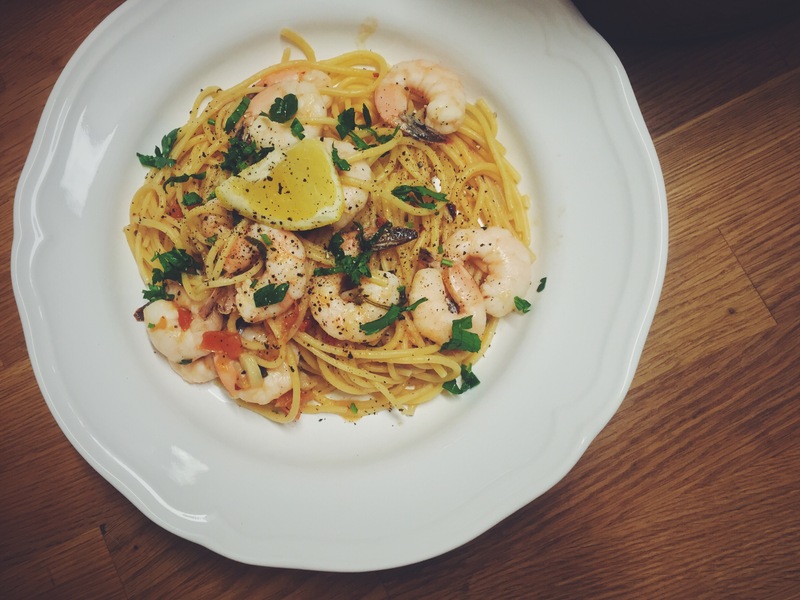 Your lip smackingly delicious prawn linguine is ready to serve. It’s best enjoyed with a garnish of cracked pepper, a wedge of lemon and of course more wine. What a great post and dish!!! What kind of wine do you like to pair with this dish?